Care Packages for Soldiers: Fantastic Stanley Black & Decker tool donations our the Troops! Fantastic Stanley Black & Decker tool donations our the Troops! Stanley Black & Decker has once again assisted with a large and amazing donation of tools and related items for our care packages for U.S. Military Troops deployed overseas! A huge thanks to Stanley Black & Decker! The Soldiers, Sailors, Airmen and Marines will absolutely love these high quality items, which will help in their work duties and for building tables, benches, shelving and other building and repair projects. Items include drills/drivers, cordless screwdrivers, spotlights, multi-tools, socket sets, tool bags, chargers and batteries. 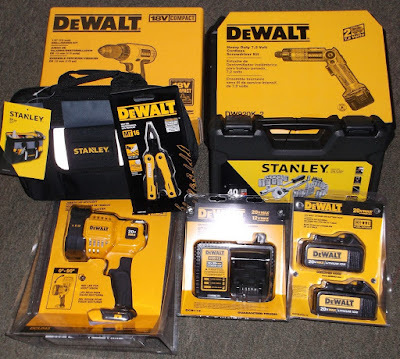 Stanley Black & Decker (besides their namesake brands) also owns top quality brands such as DeWALT, Craftsman, Irwin Tools, Porter-Cable, FACOM, LENOX, Lista, Mac Tools, Vidmar, Bostich, Sonitrol, AeroScout and InnerSpace. The all-volunteer Airborne Angel Cadets of Texas are excited to include these Stanley Black & Decker items in our care packages. These items are not always available to our troops at remote bases, so they are memorable and practical care package items that are super appreciated! We do receive tools and related hardware (mechanic's gloves, etc.) from other donors ... local Lowes, Northern Tools and Home Depot stores, and from individuals and companies. We welcome those who would buy smaller-sized Stanley Black & Decker items at your local hardware stores, and donate them for our care package efforts. We will pay the postage to ship these care packages. Thank you Stanley Black & Decker for your amazing support of the Troops! Sampling of the great Stanley Black & Decker donations!